Congratulations to Team One for their winning entry. Thank you to all the people who voted (All 147 of you). Well done both teams for representing PES and I am sure they were appreciated by Mr Wetere and Dr Bruce Bryant. The Boys team have won themselves a free lunch provided by Ms Tito. Puna Kupu from KPE TV on Vimeo. You had a sneak preview today during PENN. If you wish to watch the 'Thank You' messages again click below. If you want your vote to count, click on the link underneath the movies and choose your favourite message from either Team One or Team Two. Only one vote per student please. Don't forget to watch PENN next monday for the results. Thank you Mr Wetere from KPE TV on Vimeo. i mato e manaia le aoga. fafetai mo ms tito. My name is Ieremus. I come from Samoa. My teachers name is Ms Tito. She is a good teacher. I am happy that she helps us. I love this school. Thank you Ms Tito. We thought this day would never arrive. The students of Room 19 received their Netbooks yesterday and spent the last part of the afternoon labelling and doing initial log-ins on their very own netbook (well, I should say loan netbooks until the end of the year). This morning after Karakia, Mihimihi and Himene the students had their first 'play' with their netbooks. The classroom was filled with excitment and there was a definite buzz of activity throughout the morning block. There were moments of excited "Oooooooooooh's" and frustrated "Awwwwwwwww's" as students worked through the basics and setting up process. I managed to capture a few moments via video and photographs in between supporting students. Take a look at a snippet of our 'Netbook' morning. These are our technicians that are learning how to use our new net books that have arrived here at Pt England school. First they started off with unpacking the net books and then they started to Image them . Being a Technician you have to be reliable and when something is wrong with the net books they are the students who fix them so that they can work properly. If you look above you will see two technicians trying to image our net books known by the names of April and Nathaniel. They are two of the year 7 students . As you can see here are some more students working on the same project. "Working hard technicians. " Room 19 spent a term learning about two Mighty Teenage Mariners called Jesse Martin and Jessica Watson. During their study 'Boy' the movie was released. The movie inspired the students to recreate their own snippet of 'Boy' using 'Jesse Martin' as the main character. This film was written, planned, animated, filmed and edited by Year 7 students. We hope you enjoy 'Jesse'. Jesse from KPE TV on Vimeo. Our new intermediate is looking fantastic it's almost finished and looks better than our school it's self. We all can't wait till it's up and running all the builders are working hard and so you get an idea of what it looks like so far here is a little slide show of it still being built. Posted by TomJoe Tavita. 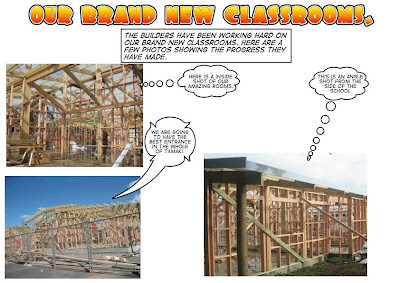 Feki has been given the responsibility of documenting and sharing the progress of our new Senior Block currently being built right here at Pt England School. At the end of last term a wonderful reporter by the name of Amy McGillivray interviewed the students to write an article for the 'Class of the Week' section in the East and Bays Courier. The students put together a mini presentation for Amy answering the question "What is great about our class?" 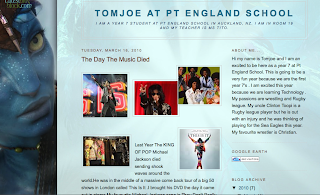 Amy chose to write about their blogging. 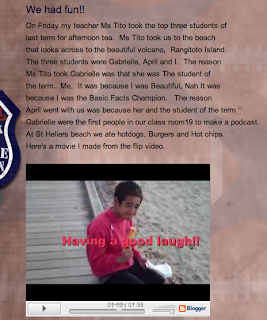 Check out what Room 19 students had to say about their blogs. Zanes post gets to feature first as Post of the Week. 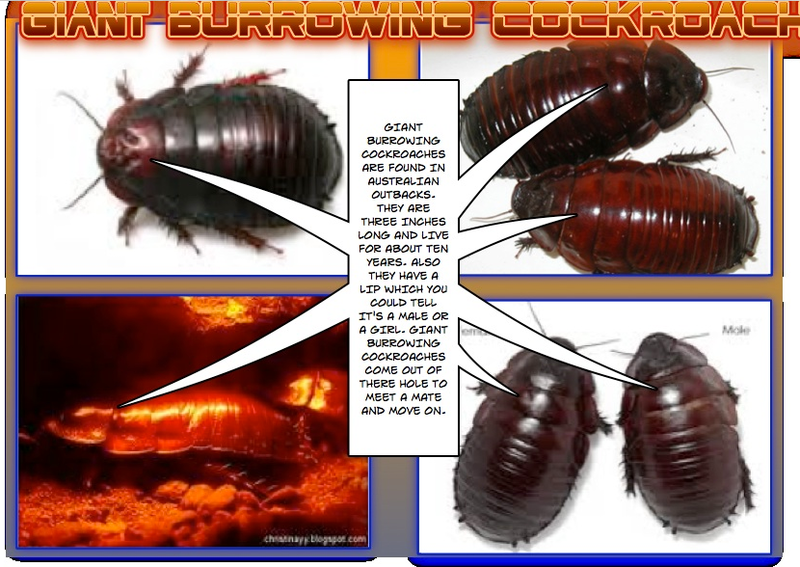 ﻿﻿﻿﻿This term we are learning about little critters. This is what I have learned about Giant burrowing Cockroaches. As part of our studies about ‘Mighty Teen Mariners’ our class is looking at the Multiple Intelligences. We used our interpersonal intelligence and we put together a little quiz for you. 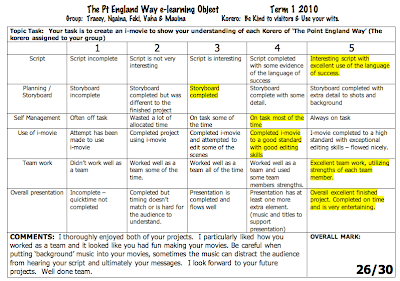 We are looking at Blooms Taxonomy also and have shown our understanding of what we have learnt by ‘Creating’ the quiz. Why don’t you check it out because you might even learn something new from these questions. You can answer the questions in the comments box and we’ll let you know if you answered correctly. As you can see this is just a little snippet of the Famous Mighty teen Mariner, Jesse Martins voyage. We were given a time limit of only 1 hour and 50mins to complete our task. Ms T taught us about the Multiple intelligences. We chose two of them, which was Visual/spatial, that involves art and Musical/rhythmical. We used hyperstudio to create our animation and we edited using Imovie. We also created a soundscape using garageband for our amazing background music. Last week the Pukeko group made some fabulous Bubble artwork. This movie was filmed by the students and edited by the wonderful Mrs Clarke. Aren't they lucky! Well done Brennan, Jane, Junior and Charlie. 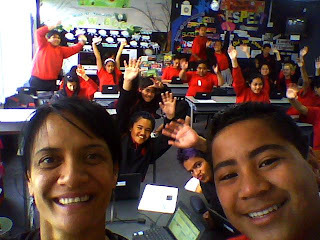 Kia ora koutou - Hi everyone. I had an easy choice this week. Raven wins post of the week due to his effective paragraph writing. 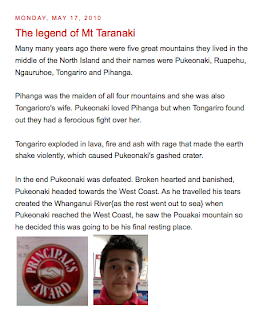 The students chose to learn about the legend of Mt Taranaki (you might have heard we are studying Volcanoes this term). Students were asked to retell the legend in their own words. Our big writing focus this term is writing effective paragraphs and we are slowly moving into writing full pieces of writing. This is a very good example. Students are now turning their pieces of writing into various kinds of digital learning objects - so, watch this space as their DLO's are due in next Wednesday. Oh, and by the way, Raven also had the privilege of sharing his writing with Mr Burt (our wonderful Principal). I am very proud of your efforts Raven. Keep up the great writing. To all you fans out there, don't forget to leave a comment on Ravens' blog. Year 7 I hear you ask? 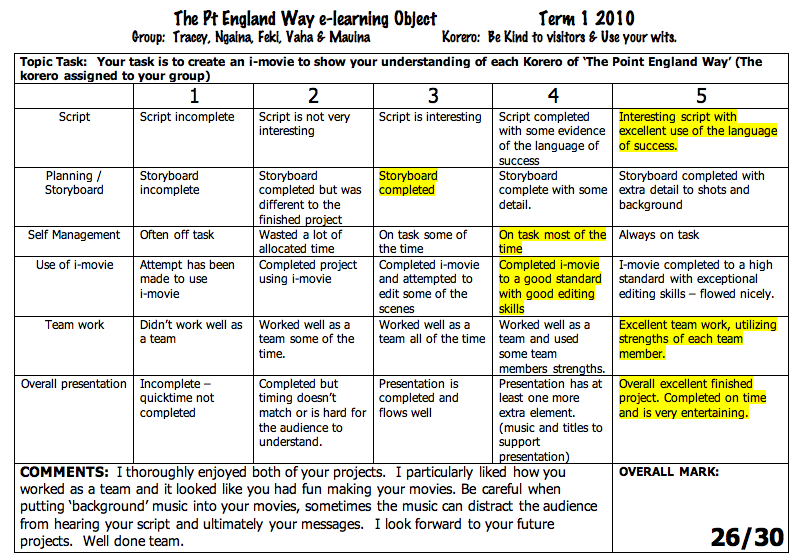 At Pt England School? You better believe it! For those of you who haven't heard... Pt England School in now a full primary, which simply means our year 6 students who would normally head off to an intermediate, can stay here and continue their learning journeys through to year 8.